The traditional Thanksgiving dinner usually evokes weary sighs at the thought of potato mashing, gravy making, turkey carving and getting the entire meal to the table--hot--all at the same time, and all at the last minute. The ideas in this article and the linked recipes are designed so that once the turkey is in the oven, the cook will be essentially work free on Thanksgiving day until the last 45 minutes. Then he or she will simply be assembling and heating food. The preparation and cooking is done, for the most part, in the days prior to Thanksgiving (see timetable following the menu below; see shopping list at the end of this article). Several of the "recipes" are guidelines for simply prepared foods, such as baked and stuffed potatoes, cranberry sauce from a can dressed up with Mandarin oranges and pecans, frozen peas enhanced with mint and butter, and so on. Note: This menu is designed for eight people. Roast Turkey--roast unstuffed to facilitate quick and easy carving (follow instructions that come with the turkey). Work backwards in terms of how long to roast it, so it is done 45 minutes before serving time. A 10-pound turkey is suggested for 8 people, but you may want leftovers. I've organized the cooking into: 2-3 weeks ahead; 3 days ahead; 2 days ahead; 1 day ahead; Thanksgiving day. Before eating, place the persimmon pudding in a pot to reheat for 45 minutes (as instructed in recipe--see link). Keep warm by leaving it in the pot with heat turned off if you want to wait a bit for dessert. Serve hot with the chilled Lemon Cream Sauce. Recipe Link: The Persimmon Pudding (actually a steamed cake) is served hot with a chilled Lemon Cream Sauce and is one of the most popular desserts I've ever made. Best of all, the pudding can be made weeks ahead if desired and refrigerated or frozen, and the sauce can be made the day before. Easy Cranberry Sauce Recipe: Mix 2 15-ounce cans whole berry cranberry sauce with 1 11-ounce can drained Mandarin oranges and 1 cup chopped pecans. Make 3 days ahead, cover and refrigerate. Easy Vinaigrette Recipe: Make Sherry Vinaigrette up to 3 days ahead (blend 1/2 cup walnut oil, 1/4 cup sherry vinegar, 1/4 teaspoon salt, 1/4 teaspoon white pepper and a pinch of sugar, cover and refrigerate until serving time). Toss at serving time. Recipe Link: The Madeira Gravy can be made up to 2 days ahead, refrigerated and heated stovetop or in microwave just before serving. Easy Stuffed Potato Recipe: Bake 8 medium white potatoes and 8 medium sweet potatoes the day ahead, cut a slice off the top and remove the insides. Season and mash them, separately, adding salt, pepper (white pepper for sweet potatoes), butter and milk as desired, then stuff the potato mixture back into the shells. Cover and refrigerate. Bake in a preheated 375ºF oven for 30 minutes. Tip: herbs and green onions are great in the white potatoes. A bit of fresh orange juice (and bourbon if desired), and chopped pecans give the sweet potatoes a new zest. Easy Minted Peas Recipe: 1 day ahead, mix 30 ounces defrosted frozen peas with 4 tablespoons butter, 2 tablespoons water, 3 tablespoons mint jelly and 1/2 teaspoon salt. Heat to melt butter, cool, cover and refrigerate. Heat stovetop or in microwave just before serving. Easy Stuffing Recipe: Make your favorite packaged stuffing 1 day ahead, add one half cup drippings from the turkey pan and bake in a preheated 375ºF oven for about 30 minutes--see timetable. You will have stuffing that tastes like it was cooked in the turkey. Lemon Cream Sauce, 1 day ahead--see Persimmon pudding. 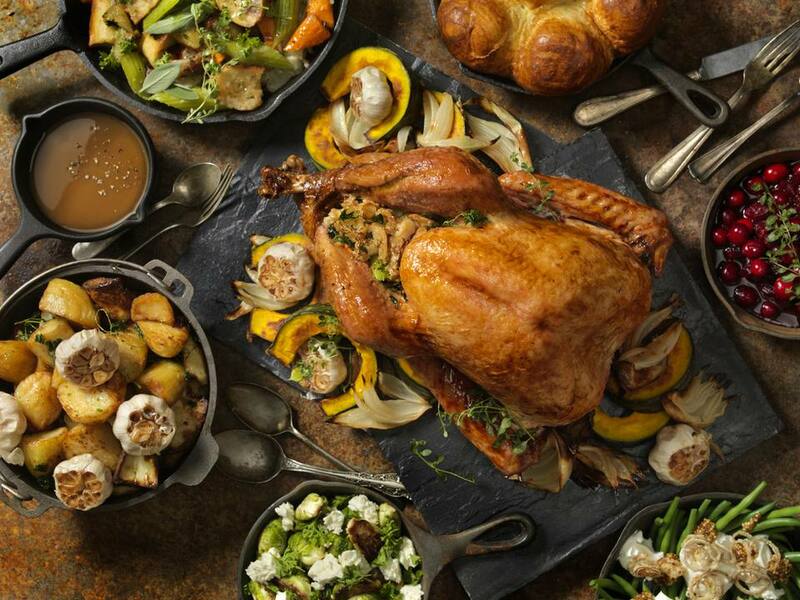 What Are The Best Roast Turkey Recipes for Thanksgiving Dinner?